An Anachronists Encyclopedia: Clothes Information on clothing form Pagan Anglo-Saxons to making an Elizabethan corset and everything in between. Clothing and Costume Links A large links page full of links to how to's and instructions, designing your own costumes, costumes from different eras and cultures, pictures of SCA'ers in costumes, and much more. Costume Making and other Textile Arts A wide variety of costume articles from the SCA London web page. Costumer's Manifesto "One-stop site for costumers information and images"
Extant Clothing of the Middle Ages This page is entirely compiled from books about clothing and jewelry, with commentary either by the authors, or by people who have sent me scans of their material, as noted. History of Costume From the Egyptians to the 19th Century, with plenty of graphics. The "History of Costume" or "Zur Geschichte der Kostüme" was printed from 1861 to 1880 in Munich by the publishing firm of Braun and Schneider. Seamstress: Here are some great links if you are interested in making your own costume. Eachna's Celtic Clothing An online reference for re-creational medievalism, which involves making a sincere effort to reproduce the lifestyle of a race or region of the distant past. Viking Resources for the Re-enactor A fellow S.C.A. member. Not as rich in pictures as the Viking Answer Lady, but this site concentrated more on the Norse textiles and styles of dress. Institute of Draped Clothes An institute for the research, study, preservation and promotion of draped clothing such as saris, Roman togas, sarongs, and other unstitched costumes found all over the world and History. The Great Kilt How to wear and wrap it. Tartan Finder Search engine to find different clan tartans. Elegant Stitches Heirloom sewing supplies. Among other supplies, they also carry reasonably priced tartan cloth. Irish County Tartans These new tartans, inspired by the Irish counties, are reminiscent of Ireland with soft, warm colors dominating every stitch. 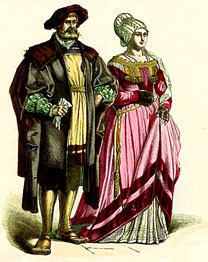 Anastacia's Garb & Pavilions This site is for SCA and pre-1600 reenactment enthusiasts looking for well constructed, reasonably priced, researched Garb, Pavilions and Accessories that make our hobbies the wonderful fun that they are. Stich Witch Medieval Clothing Here you will find the premier directory of links to some of the folks making & selling medieval & Renaissance clothing on the web today.